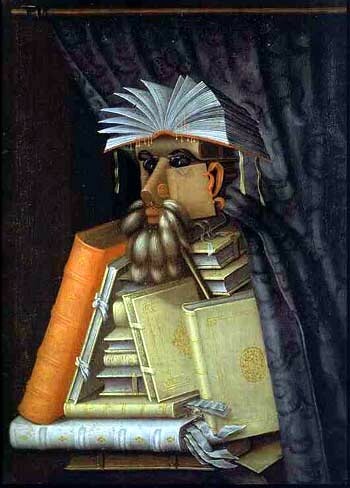 "The Librarian" by Giuseppe Arcimboldo. 23 April is a symbolic date for world literature, for on this date and in the same year of 1616, Cervantes, Shakespeare and Inca Garcilaso de la Vega all died. It is also the date of birth or death of other prominent authors such as Maurice Druon, K.Laxness, Vladimir Nabokov, Josep Pla and Manuel Mejía Vallejo. It was a natural choice for UNESCO's General Conference to pay a world-wide tribute to books and authors on this date, encouraging everyone, and in particular young people, to discover the pleasure of reading and gain a renewed respect for the irreplaceable contributions of those who have furthered the social and cultural progress of humanity. The idea for this celebration originated in Catalonia where on 23 April, Saint George's Day, a rose is traditionally given as a gift for each book sold. My favorite books are J.K Rowling’s Harry Potter series and Jane Austin’s Pride and Prejudice, what’s your favorite book? Well i must say that reading for sure needs to be celebrated and definitely all young people need to be encouraged to read! Personally, i don't have a favorite book because each time i read a new one that i like ,it becomes my new favorite! My favorites: Amin Maalouf's Rock of Tanios, Samarkand, Balthasar's Oddyssey. Ghassan Kanafani's Returning to Haifa. Isabel Allende's Daughter of Fortune. ummm, My favorite authers are, JRR Tolken and Jane Austin. I'm glad we have such a day, I personally regard reading a book as being one of the most elevating activities. I look at reading as being my only chance to learn about the stuff I care about. Since school hardly offers such freedom. I like Victor Hugo's Les Miserables, and Frank Mccourt's Angela's Ashes. Well I guess must say the Quran cause I am a Muslim but my favorite human-written book I guess is the whole collection of Khaleel Gubran books and the collection of Al-Manfaloutty works that's in Arabic but as for English I can't quite say cause I am still discovering great authers every while but I can say The Kid is a good novel as well as the Memoirs of a Gueisha. I was watching today the news on MBC and they mentioned that today was the World Book day. I learned a few interesting things that I would like to share with you. yeah tell me about it, I guess the Arabs are more interested in installing sat. dishes and watching Superstar or mexican TV series than reading something useful.... What a waste. Oooh I absolutely love J.K.Rowling. She's amazing! Sheer creative genius. I have a lot of books I love, but I'm going to say anything by Anne Rice at the moment. I love vampire fiction. Dina. I feel flattered to discover that the World Book Day happened to be on my birthday, but at the same time a little disturbed to learn that all those great authors died on this day as well! Interestingly, and coincidently, the first present I got for my birthday this year was a book, one that you had higly recommended to me but I hadn't had the time to buy it yet. "The Da Vinci code" by Dan Brown. I started reading it yesterday and I am glued to the book that I will not leave it. I'm already half way through! It seems it's already in my favorite books category along with Tolkien's "The fellowship of the Rings" and "The Hobbit". P.S. thanks for the e-card! Sinan-yes it is sad that we Arabs are interested in such silly programs rather than read a good book. Linda-That festival sounds great, and i hope you get to read all the books you want once you finish school. Great picture. I'd love to get that hanging in my room. i am late to coment, but i have to say that i'm interested in recent history, religions and islamic history, and some political researchs. also i'm interested in short stories. i'm fathful but i hate religious books. Thank you Amr for sharing. It looks like you're a serious reader. Ice Cream Cone...a Syrian Invention?